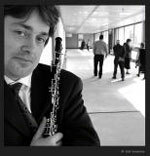 The musical career of oboist Piet Van Bockstal meanders along classical paths (Royal Flemish Philharmonic since 1985, countless performances as a soloist or in the context of chamber music at home and abroad). However, his real passion is devoted to contemporary music: he has been co-founder of Ictus, plays regularly with Champ d’Action and musikFabrik Köln and relentlessly inspires contemporary composers to write for the oboe (among others the creation of the oboe concerto of Kalevi Aho). In a recent past he has been manager at RCA and at the baroque ensemble Il Fondamento as well as artistic director at the Young Philharmonic.